Where the bloodlines of the Nephilim leave off, the real story just begins. Or does it go back even further than that? The very real probability that non-human intelligences visited and even copulated with primordial humans is detailed in civilization's most ancient cultural and religious records. These historical records further reveal that these intelligences were reptilian in nature--or, at the very least, have been represented throughout human history in reptilian form. From the Serpent, Nawcash, in the Garden of Eden; Atum, the Egyptian snake-man; and Quetzalcotl, the feathered serpent god of the Mayans to the double-helix snake symbol of Enki/Ea in ancient Sumerian literature, the serpent has been the omnipresent link between humans and the gods in every culture. 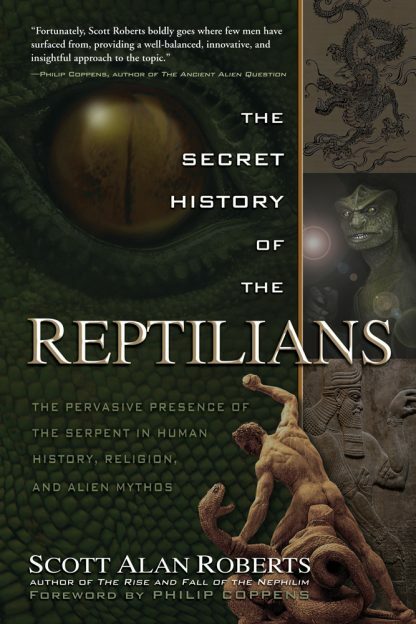 In The Secret History of the Reptilians, Scott Alan Roberts investigates and examines the pervasive presence of the serpent in human history, religion, culture, and politics. Are we the product of an extraterrestrial race that moves and breathes--and even breeds--beneath the surface of all of human history? Put on your thinking cap and take an historical, anthropological, archaeological plunge into the heady waters of extraterrestrial origins. Scott Alan Roberts is the founder and publisher of Intrepid Magazine, a journal dedicated to politics, science, and unexplained phenomena. He is a radio show host and popular public speaker. Roberts was editor-in-chief of SyFy�s Ghost Hunters official publication, TAPS paraMagazine. He attended Bible college and theological seminary, working toward his master�s in divinity, but left for a 33-year career in advertising and publishing as an art and creative director, designer, illustrator, photographer, and writer. Roberts is the author of The Rise and Fall of the Nephilim.